Video Shows North Korean Soldier's Dramatic Sprint Across Border : The Two-Way Newly-released CCTV footage shows a jeep speeding through the countryside near the DMZ. Inside is a North Korean soldier making a desperate escape. Newly released closed-circuit television footage shows a North Korean soldier sprinting south across the border last week while his fellow soldiers fire on him. The closed-circuit television footage is silent, but that makes it no less dramatic. A jeep speeds through the North Korean countryside, crossing what is known as the 72-Hour Bridge. Inside the vehicle is a North Korean soldier, making a desperate escape. All but the headlights disappear behind tree cover. The video changes. We see North Korean soldiers running from their posts. The video shifts again. The jeep is stuck in a ditch. The driver leaps from it, and he sprints south under gunfire from his fellow soldiers. In a separate frame, we see him run across the border. 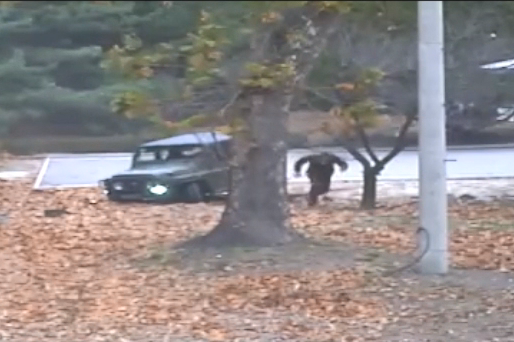 In pursuit, a North Korean soldier also runs across the border. He looks down and seems to realize what he has done. He turns around and dodges behind a building on the North Korean side. The episode transpired on Nov. 13 in the Joint Security Area, according to The Associated Press. Infrared video shows South Korean soldiers 40 minutes later, crawling toward the defector, who lies wounded about 55 yards south of the border. They drag him to safety; he is then taken aboard a U.S. Black Hawk military helicopter and rushed into surgery at a hospital near Seoul. The Joint Security Area is the only portion of the border where soldiers from the two countries stand just feet apart — and thus is one of the only areas where a sprint across is feasible, The New York Times reports. The last time a North Korean soldier defected across the Joint Security Area was 2007. Footage of the incident was released this week by the American-led United Nations Command, which administers the site on the southern side of the border. The Joint Security Area lies within the Demilitarized Zone. The U.N. Command said that it had completed its investigation of the incident and that the North Korean army had violated the U.N. Armistice Agreement twice: by firing weapons across the border and when the North Korean soldier briefly crossed the border chasing the defector. Gen. Vincent Brooks, the American who leads the U.N. Command, said in a statement dated Tuesday that the battalion acted "in a manner that is consistent with the Armistice Agreement, namely — to respect the Demilitarized Zone and to take actions that deter a resumption of hostilities. The armistice agreement was challenged, but it remains in place." The defector is being identified only with the surname Oh, according to Reuters. In the gunfire during his escape, he was shot five times. Dr. Lee Cook-jong, a surgeon who treated Oh after his escape, told outlets, including the Times, that when doctors performed surgery on the his intestinal wounds, they found parasitic worms 11 inches long. "In my 20 years as a surgeon, I have only seen something like this in a medical textbook," Lee said. "Defectors to the South have cited the existence of parasites and abysmal nutrition. Because it lacks chemical fertilizers, North Korea still relies on human excrement to fertilize its fields, helping parasites to spread, the experts said. "In a 2014 study, South Korean doctors checked a sample of 17 female defectors from North Korea and found seven of them infected with parasitic worms." Lee told a news conference on Wednesday that the man had regained consciousness and was now stable. "He is fine," Lee said, according to Reuters. "He's not going to die."